Despite the annual review occurring only once a year, its looming presence has lasting, residual effects on employees’ day-to-day mentality. More often than not, it infects the culture of an organization. It generates a mindset in employees that dictates the way they work, focused on external rather than internal motivators. It’s a mindset founded on the premise of fear, and where fear exists, innovation and growth become stunted. We sat down with Kahina Ouerdane and Joanna Awogni, the visionaries at the helm of GSOFT’s Culture & Organization team. They explain in an interview why our organization has decided to go against the grade and cut out the annual review from our feedback cycles, for good. 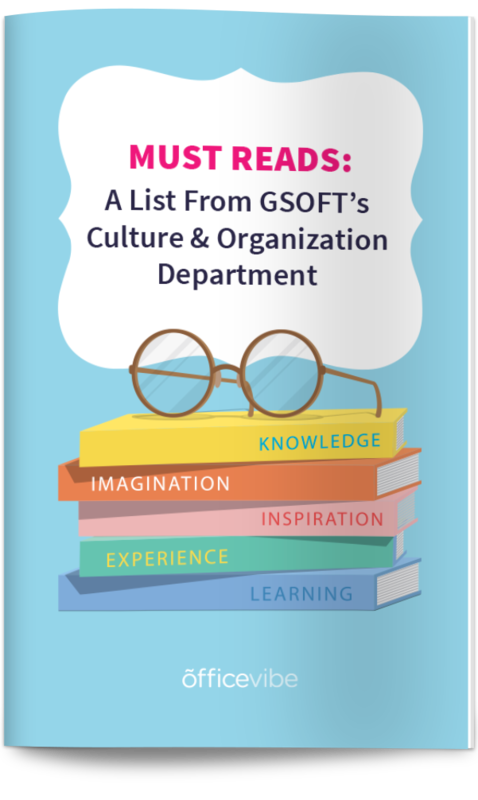 Download the complete list of must-read books and articles recommended by our Culture & Organization Team. Kahina explains that there’s a movement from the intrinsic motivation for doing things, to extrinsic motivation, and it is during this shift that purpose and meaning become lost. There’s a pleasure that’s extracted from the process when you know you’re being evaluated, so you do it for the wrong reason. Tying any sort of learning (in the classroom or the workplace) to grades and rewards removes authenticity from the act. This lack of authenticity stunts creative thinking and innovation, which are crucial aspects of company growth, differentiation, and success. Kahina and Joanna explain that annual reviews are no longer a responsible way to evaluate. There is too much recency bias, it’s inefficient and overly ambitious to think that managers can collect accurate, year-long notes, and moreover it’s demotivating for employees to feel that they “are” the number that’s assigned to them. When you assign a number value to someone, they become boxed into that number. The way that managers – and then by extension colleagues – interact with them after a grade is given, is a direct result of their perception of what that number means. This is why we need to move away from numbers and focus on something perhaps less numerically tangible but more meaningful, and less confining. Why Can’t Annual Reviews Work In Tandem With Other Feedback Cycles? Much like the process of human evolution, this is the evolution of the workplace. Things become obsolete as we begin to understand what works best, and what doesn’t work at all. The focus now is on putting employees at the center. Committing to the perpetuation of the fear-inducing annual review seems to go against the grain of humanizing the workforce. Ultimately, we’re moving from 2.0 to 3.0 management, meaning away from a command and control environment towards self-organized teams and shared leadership. This allows people to focus on their purpose, rather than on impressing other people for the sake of this final, looming grade. It lets employees see and experience work life beyond the fear factor of this final review. There is much more room for growth, innovation, and creativity when one considers the purpose and the “why” of what they do, rather than the consequences of it. The future of work is less oriented on counting failures, and more focused on encouraging risks and embracing mistakes whose genesis was from an intellectual curiosity to test and explore. The movement away from this feedback process, which has been embedded in many organizations for decades, requires a lot of reflection. It’s tough to break free from habits – especially since there’s something clean and simple about being able to tie up the whole year in a bow with a final review. Even if companies understand that the process is broken, the process of change is too heavy for many organizations to implement without clear directions for replacement. Change is scary, but sometimes the pangs of an initial discomfort are worth it, if not necessary. It doesn’t matter if you are a small start-up or a 50-year-old enterprise. If you want to survive as an organization and meet the needs of top candidates and the most forward-thinking talent available, it’s time to start thinking about putting the wheels of change into motion. It’s inherently counter-intuitive as the direction of growth is forward, and the annual review is tied heavily to the past (or whatever version of it is at top of mind come the time of the annual review). Getting rid of the “grade” is necessary for any successful learning environment, and what employees care about more than pay, or benefits is the opportunity learn and grow. The first step to accomplish this is constant communication, and the opportunity for year-long feedback, not once a year feedback. It’s too late by then. There is no end to learning so “ending” the year with an annual review follows a start-stop movement, instead of a continuous, circular one. With the change of processes, we also need to change the language we use surrounding these processes. Words are full of meaning, connotation, and power, so organizations must consider the ones they use carefully – it will shape the culture of your company, as well as the energy and tone, and therefore how employees perform within it. Kahina and Joanna explain that words of ‘winning over’ and ‘power over’ rather than ‘winning with’ and ‘power with’ are detrimental to teams. Evaluation-Appreciation:The word evaluation is probably one of the most loathed words in the English language, so let’s change the way we approach performance. Replace evaluation with appreciation, a more positive, yet still powerful word. The first step is to define your company’s core values. Know them. Mean them. Live them and breathe them. Share them with your teams often. Individual grades and your own performance are not what is most pertinent in the workplace. What matters most is the team, and a collective movement toward common and shared goals based on a value system. Values will be broken down into different criteria on what we call a “Heat Map,” which is what will be used every 3 months in between the regular monthly one-on-ones to check in on employees’ development. The subsequent one-on-ones will follow up on the progress. Green- Strength to keep up! No one is stuck with a number. Instead, colours are used to represent an employee’s state of development with regards to the value set. This new method will inspire employees to continuously look at the greater purpose and the WHY they do what they do. It will focus on constant development, which lets employees know that there is always room for growth. Once we test out our new method, we will share our insights, feedback and templates with you in a follow-up post. Stay tuned! Assigning grades to learning kills creativity by making motivators external, not internal. The fear that the annual review brings to the workplace inhibits innovation. Feedback needs to occur all year-long, not only once a year. Employees need constant communication in order to learn and grow. We need to be more mindful of our words and avoid using confrontational language. Matching employee’s performance to a number keeps affects the way they are perceived *by themselves and their managers), and therefore treated. Performance should be tied to values, to keep everyone moving collectively towards a common goal. What do you think of this new process? Feel free to comment below!